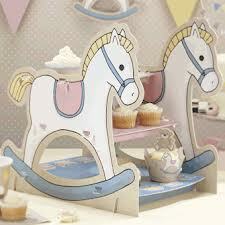 As cupcakes have become the 'Must Have' cakes for a baby shower party, we now offer a fabulous range of stands to display your lovely cupcakes. This will make an ideal centrepiece for your table. We also have a great supply of high quality novel cake tins if your are feeling very creative and want to make your own baby shower cake. Plus cookie cutters for your homemade themed cookies. Once decorated, these make ideal favours for your guest to take home and you can personalise them with names.